SpongeBob and his friends are back—and like you’ve never seen them before—in the all-new blockbuster hit THE SPONGEBOB MOVIE: SPONGE OUT OF WATER now out on Blu-ray Combo Pack, Blu-ray 3D™ Combo Pack, DVD and VOD from Paramount Home Media Distribution. Who Lives In A Pineapple Under The Sea?! If you sing this song in my house, guarantee you will hear someone else yell back, SPONGEBOB SQUAREPANTS! SpongeBob is a well-known character that not only my kids love, but both my hubby and I use to watch when we were younger. So it was great when we got to review Sponge Out of Water. This movie is what you would expect from the hilarious television series. Filled with our favorite characters from the show, Sponge Out of Water was a huge hit in my house with both adults and kids. It was something we got to watch together and if you are an avid reader of Just Us Girls you know that watching movies together is always happening around here. If you and your family are fans of the hit cartoon series, then this is a must see and add to your movie collection. We've watched this a few times and my kids still love it. Definitely a movie for the entire family to enjoy. Disclosure: All opinions are my own. 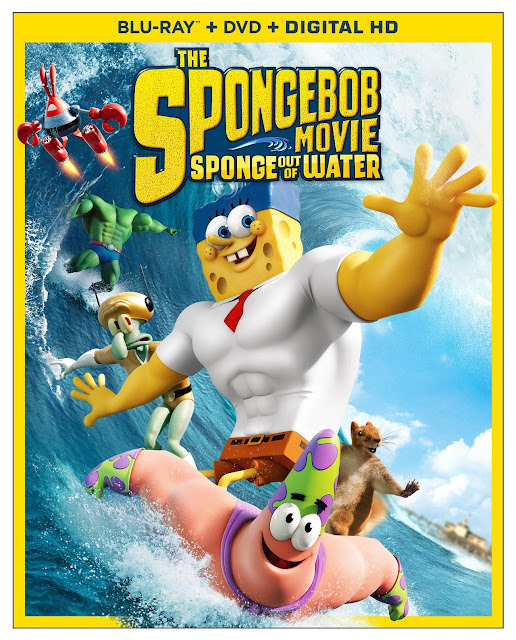 I received The SpongeBob Movie: Sponge Out of Water at no cost for the purpose of this review. No other compensation was received.